Your Batteries: Safe, Smart & Powered for Longer. Your radio is only as reliable as the battery that powers it. Make sure it’s proven tough. Your radios work best when your replace your old batteries with new Motorola® Solutions brand batteries, including Impres™ technology smart batteries. Let ComtronICS show you how Motorola® Solutions batteries are built tough, tested tough, and proven tough. 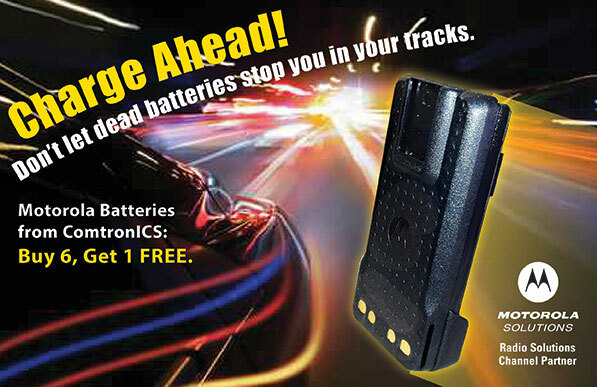 ComtronICS recommends that you replace your radio batteries every 18 months. Now through June 30, 2019, purchase any 6 of the same Motorola® Solutions model batteries and receive 1 of the same model (any quantity) when you mention promo code MOTBAT19 at the time of placing your call-in order. ComtronICS is your preferred Motorola® Solutions Two-Way Radio Partner!